Upcoming is a simple way to share and discover interesting events from your friends, followers, and the artists and organizations you care about. This is a historical archive of more than 7 million events saved from Upcoming's first ten years. The vast majority of events were saved, and the original URLs for nearly all of them are active again — along with the original venue, watchlist, and comment metadata. Not all the original metadata could be saved, but this represents the vast majority of it. No search or homepage just yet, sorry — but profiles, event, and venue pages should all be working. Nearly every original Upcoming.org URL resolves to its permanent archive location. Want to play around with it? Try copy-pasting any Upcoming URL from the Twitter archives, or start browsing from my profile or a popular event. Special thanks to Jason Scott, Archive Team, and the Internet Archive for their complete save of the original Upcoming.org archives, and everyone who contributed their time and spare cycles to rescue the data. 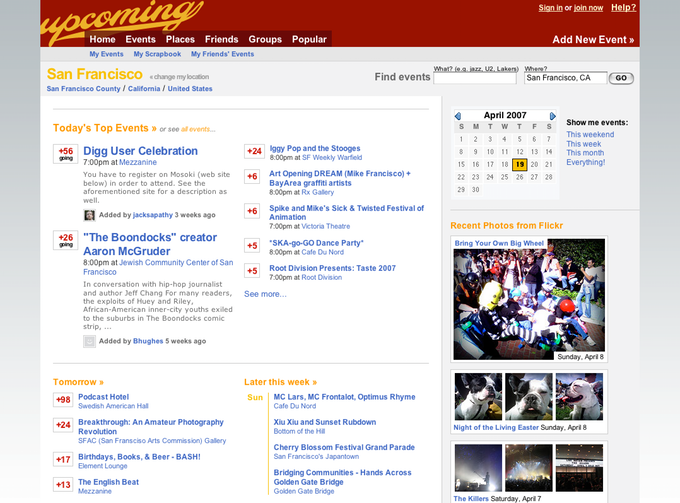 Launched in 2003, before Flickr or Facebook, Upcoming was the first site to use a social network for event discovery. After two years, Upcoming was acquired by Yahoo, running for a decade before closing in 2013. Shortly after they shut it down, Yahoo offered to sell the domain back to me, an unprecedented move for a former acquisition. I decided to launch a Kickstarter project to gauge interest in bringing Upcoming back from the dead. With the incredible support and infinite patience of 1,787 backers, I've been rebuilding Upcoming from scratch over the last two years, currently beta-testing privately with the backers that supported it. This digital archive was funded by the supporters of the original Kickstarter project. Thanks to everyone who believed in it. Upcoming was developed and designed by me, Andy Baio. I started Upcoming in 2003, and was joined a year later by my friends Leonard Lin and Gordon Luk, who came on board as co-founders. Gordon moved on to other projects, and Leonard is a technical advisor for the latest incarnation. This project would not have been possible without the support, both emotional and financial, from the 1,787 backers on Kickstarter. Sorry to keep you waiting.